-- Select a Size -- X-Small Small Medium Large X-Large - Out of Stock! 2X-Large - Out of Stock! 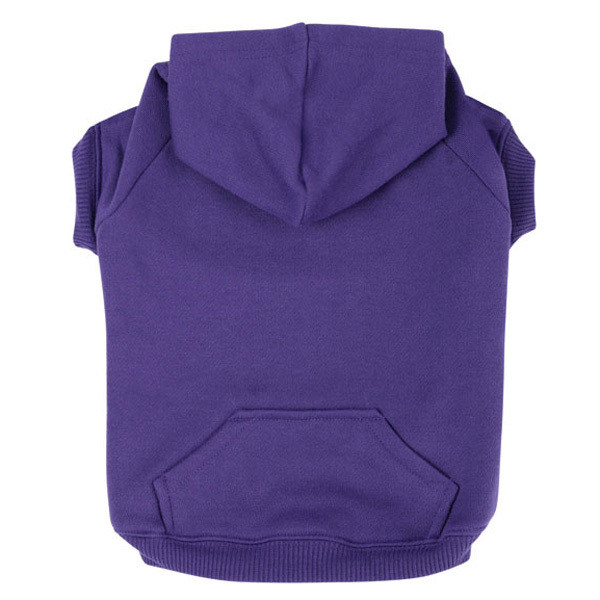 With our Zack & Zoey™ Basic Dog Hoodie in Ultra Violet, your pet can enjoy the same comfort you do in a hoodie made just for them! For those cool weather days when your dog needs a little extra insulation, the Ultra Violet Basic Dog Hoodie is an excellent choice! 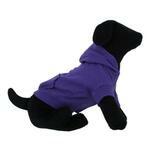 This perky purple hoodie will have your pup standing out and feeling toasty even on the dreariest of days. This hoodie is a great choice for supporting your favorite purple sports teams (go Colorado Rockies!) and would work for Mardi Gras as well! This garment won't impede your pup on their walks thanks to the high-cut tummy designed to prevent soiling. Also handy is the leash hole found under the hood at the base of the neck that can be used with a collar and most harnesses. 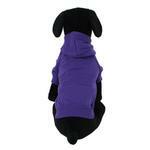 Basic Dog Hoodie - Ultra Violet Customer Photos - Send us your photo! Dinky loves staying warm and cozy while also looking exceptionally stylish in her violet hoodie. The back pocket is a great bonus! Athena is currently in the fight for her life against Acute Liver toxicity of an unknown cause and is still rocking her Hoodies everywhere she goes! SnickleFritz looking stylish in his new purple hoodie! It fits him perfectly & really brings out his Brindle coloring. Perfect for those cold winter nights. We just received the wonderful basic Hoodies, and they love them. The four fur babies couldn't wait to try them on as they are getting ready for Fall, with the cooler nights. Three of the babies have longer hair, but Hershey gets cold really easily, so he loves wearing his hoodie all the time! Truffles (Raspberry), Reeses (Violet), Cariboo (Turquoise) and Hershey (Parrot Green). They are great quality and the colors are bright and fun. Thanks! Diamond knows she looks fabulous in this hoodie. Purple is totally her color and she has no problem getting all cuddly and posing for pictures in it. It is also perfect for running around the park because it helps people know she's friendly. We are very thankful for finding her perfect sweater, and for such an affordable price! Athena loves her hoodie but its too small for her now : ( She would love to win so she can get something new! We are Bella & Brookie. We are 10 month old Chihuahua mix puppies. Today we are modeling our Raspberry Sorbet and Ultra Violet hoodies. They are so soft and comfortable. I am a 10 month old puppy who I trying so hard to stay out of trouble...it is very hard. Mr. Sparky is wearing the purple hoodie and Muffin is wearing the bluebird hoodie. Muffin turned 17 on September 15th and Mr. Sparky turned 2 on September 18th. They are very uncooperative, yet absolutely adorable in their birthday hoodies! Sasha sitting pretty in a sea of purple. Here's my little roxie sporting her new cute purple hoodie!!!!! This is Tucker. He likes wearing his hoodie on chilly mornings. Fiona is a rescue, but her DNA test reveals that she's a Choodle (Chihuahua/Poodle). She's almost two years old and loves everyone -- she's a hippie chick at heart! Odie received this cute hoodie as a Christmas present and it's one of our favourites! It fits so well, and the hood helps to keep her neck warm. We love it! She loves her hoodie! lol she likes to run around sqeeking her toys,she is very smart and full of life, she is 5 months old and she loves to be a lap dog. she is very comical. Molly and Maddy are the sweetest dogs ever. Molly ia a Maltese ans Maddy is a Yorkie Poo. They are under 5 lbs and full of life. He is The Coolest and Yes I Spoil Him With Your Wonderful Clothes... Baxter Boo is the Best!!!!!! Muphy 8 yr old bichon and Zoey, 2 yr old maltese wearing their matching violet hoodies! Stella is a very energized 2 and a half year old Chihuahua who loves everyone!!! Sookie is an amazing dog with a personality big enough for a Great Dane! Yoorki-Poos are awesome dogs! This is a great quality hoodie! Bella love's it! Get my good side, Mom! Oliver loves his new hoodie! Thanks Baxter Boo I love my hoodies my mom buys me. I need them to keep me toasty warm in the Oregon rain. Woof! Midnight (purple), Pretty (Pink) and Buddy (Camo) LOVE their new hoodies from Baxter Boo! Gabi enjoys sitting on a park bench in her Ultra Violet hoodie. Our rescue chihuahua is under the impression that she's "gangsta". My puppy loves this hoodie... she wants to jump inside it when she sees it because she knows it will keep her warm! Plus it is adorable..
Zoe lounging in her new hoodie! Shu Shu is definitely a beach girl! Shu Shu loves the Beach! Logan in his new sweatshirt! Olive spending a cold Saturday afternoon in her purple hoodie. She loves it!! We love it on her. Liza is happy she got her hoodie for Christmas since we had out first white Christmas in 140 years according to the record books. Hood's up and Lola is ready to brave the nippy NJ weather! Lola is ready to cruise the neighborhood in her new hoodie! Leon loves his new hoodie! He can pull up the hood when his ears get cold! Annie just LOVES her purple hoodie!! It is GREAT quality - and so darn cute! New hoodies!!!!!!! YAY! Thanks Baxter Boo! Daphne loves her hoodie so much that she insists on wearing it to sleep! Miss Bella in her hoodie. It's definitely her favorite item of clothing! Roxie, our 11 year old german shorthair is warm in her ultra violet dog hoodie! Bebe's first camping trip decked out in Zack & Zoey's Basic Hoodie. Warm and soft to keep your pet warm on a cool day. Super bright color! Great colors to choose from, Sizes to fit anyone, even a Frenchie, easy on and easy off. I feel pretty in my new ultra violet outfit. Covers my head, neck, chest & belly with room to take care of business. Thank you BaxterBoo! Posted On 02/23/18 by Tanya K from Milwaukee, WI Yes, Tanya K recommends this product! These hoodies are perfect for our Boston Terrier puppy. He loves them & feels comfortable in them. He has about 4 different colors now. I love how they look like a real hoodie that a person would wear. Holly is a very petite Westie and sometimes just does not meet all the measurements of 1 size. Holly is 13.5 lbs. This one was too long for her but fit all the other areas. I am in IL and the winter has been cold AND I foster Westies and a lot of them come to me shaved down so this will work great for a little larger dog. Keeps them warm. Hillary looks cute and loves wearing this awesome sweatshirt when she travels up to Toronto from South Florida. The fit is perfect and she looks adorable. It washes well as well. Posted On 12/27/17 by Brandy B from Hobbs, NM Yes, Brandy B recommends this product! Posted On 09/25/17 by FH from , Yes, FH recommends this product! We ordered a S, M, and XL. The S and M fit well, but the XL was slightly snug around the chest. The XXL would have been several inches too long. They are well made, and we love the color! Posted On 08/01/17 by Makayla P from carriere, MS Yes, Makayla P recommends this product! Posted On 03/28/17 by Ken C from Cumberland, MD Yes, Ken C recommends this product! Would have given 5 stars but is a bit big but sill looks adorable. Posted On 03/04/17 by Debbie B from , CA Yes, Debbie B recommends this product! Measurements are a bit odd but when you find the right size, they are pretty nice and launder well...so, we like 'em. Posted On 01/21/17 by Kim H from , Yes, Kim H recommends this product! This is a nice quality hoodie. My baby looks so cute in it. Posted On 12/31/16 by Pamela from PRESCOTT, AZ Yes, Pamela recommends this product! Oakley loves his hoodie! Excellent quality and a awesome product. When i purchase another, it will be from Baxterboo. I love this store! Posted On 12/19/16 by Celeste F from , TX Yes, Celeste F recommends this product! My dog, Genny, was skeptical about wearing this initially. But when we had a cold snap drop us below freezing, she decided it was the best thing ever for lounging around in. It goes on very easily and comes off just as easily for when she starts wrestling with her canine brother. She seemed very comfortable in it. I bought the XL for my 54 pound boxer mix, and it has a nice relaxed fit. Will definitely be adding a few more to our collection. I am extremely pleased with this hoodie. My dog loves it too! Fits well and is wearing very well. Posted On 12/07/16 by Karen B from Port Jeff Sta, NY Yes, Karen B recommends this product! I have a small dachshund that doesn't do the cold well. This sweatshirt is perfect for her to keep the drafts away until pajama time. Usually get her pink but decided to switch it up a little. This violet color is beautiful! Posted On 12/05/16 by Elizabeth from , Yes, Elizabeth recommends this product! Posted On 12/02/16 by Lou from Powell, TN Yes, Lou recommends this product! LOVE the Hoodies. I ordered 4, have 3 different sized dogs and one fit each. Fit large dogs well! The purple is even better in person. Great hoodie, looks adorable, the fit is perfect, definitely will be ordering more. Posted On 11/27/16 by Kristin N from Myrtle Beach , SC Yes, Kristin N recommends this product! This item contains soft fabric and it's easy to put on and take off. It's comfortable and washable. Shipping was fast. Posted On 11/27/16 by Pamela S from Greenville, NC Yes, Pamela S recommends this product! I have always ordered a small for my dog but according to the size chart for this item she needed a medium. It fits fairly well, maybe a bit big which is okay, but is way too long. I absolutely love this hoodie! Annie is half min. poodle and half dachsund so her body is long. This hoodie covers her all the way to the base of her tail with room to spare. Even tho she fits in a medium, most items come up a little short. The hoodie is just perfect. Posted On 11/20/16 by Roxy's Mom from , NJ Yes, Roxy's Mom recommends this product! Great hoodie and very well made. Zack and Zoey doggie apparel items are my go to for my Cavalier King Charles spaniel, Roxy. The fleece lined hoodie looks adorable and keeps my little girl cozy on chilly days. It wears and washes well, with nice colors that stay true. I size up to a Large for my 1 1/2 yr old CKC spaniel. My thin skinned pitbull needs something to keep her warm and this hoody does the trick. I was not expecting such excellent quality for the price! Posted On 11/09/16 by Tabatha c from , PA Yes, Tabatha c recommends this product! The best fit - Jack would not take it off. Posted On 11/03/16 by Brandy B from Hobbs, NM Yes, Brandy B recommends this product! Posted On 11/01/16 by Sharon B from Mobile, AL Yes, Sharon B recommends this product! Posted On 10/19/16 by Cole J from , Yes, Cole J recommends this product! I have this for my black and tan dachshund (12 pounds and got size small). It fits her really well and the purple looks great on her coat color. Big Guys need to be warm too! Great color, true to size and well made! Posted On 10/08/16 by Sarah S from , CO Yes, Sarah S recommends this product! This hoodie runs true to size, with just a tad bit of extra room to spare. It's also pretty lengthy, so you may need to hem/cut/trim it back to adjust for those male pets! The feel of this hoodie is very similar to what a human's hoodie would feel like, so it keeps your pet nice and warm! Now I want one in every color! Posted On 05/02/16 by Lisa O from , Yes, Lisa O recommends this product! I ended up taking the hood off, it seemed to bind a little around my dogs throat. But she is a small dog and the weight of the sweatshirt material is great. I can put under her coat for an extra layer on cold mornings. And it seems well made, has a little hole for the leash which is a nice touch. Posted On 03/07/16 by Kathy A from Atlanta, GA Yes, Kathy A recommends this product! The "Basic hoodie" is really nice, they feel like a sweatshirt I would wear. Also since I have an American Pit Bull Terrier who hates the cold, he loves wearing these, so he's in them all the time. Most people aren't used to seeing big dogs in clothes & these are so cute that people are always stopping me in the street to ask where I got them. Thank you so much for carrying large sizes, most businesses don't & it's hard to find him nice clothes & collars etc. Posted On 02/24/16 by Mallory L from Swissvale, PA Yes, Mallory L recommends this product! My rescue babies Roxy and Bella love these hoodies. They are perfect for inside or outside! They have 3 different colors all personalized with their name. Posted On 02/10/16 by M P from , MA Yes, M P recommends this product! Love the color, vibrant. Soft fabric. Easy enough to put on my pup. My only negative is the opening for head is extra wide and slips on her, making the hood become part of the sweatshirt on her back ... Laying flat. And not lay like a hood. Not a huge problem... Just a little annoyance on my part. It's just warm enough but not to heavy and the color is fantastic! Love it! Posted On 02/05/16 by sarah from SOUTH HADLEY, MA Yes, sarah recommends this product! Soft fabric, easy to put on. However, I had to sew the underside to prevent wetness for a male dog - it came down just a bit too far. For non-seamstresses, this might affect their review negatively. Outstanding fit. Excellent for bad weather. Buy lots! Posted On 01/28/16 by Gina R from , OK Yes, Gina R recommends this product! I was very pleased with the quality of the hoodie and how fast that I received it. I just wish that my fur baby was as happy about it as I am! Posted On 01/15/16 by Jami J from Tigard, OR Yes, Jami J recommends this product! Posted On 01/14/16 by Julie M from Tennessee Ridge, TN Yes, Julie M recommends this product! Got two of these for my (M) Shih Tzu and (XL) Mastiff/Pit mix. My furbabies always gotta match but it's hard shopping for them sometimes. The measurements given were perfect and so helpful. The boys love their hoodies and are kept warm and cozy! OMG Amazing. The color is perfect, and it fits my ridgeback's deep chest and long body just right! Posted On 01/05/16 by Sharon L from Easton, PA Yes, Sharon L recommends this product! The purple hoodie fits perfect on my yellow lab. But everytime she sees the hoodie she runs away. Great price too. Perfect dog hoodie for cool weather. A size medium fits my pugs who range in weight from 16 to 22 lbs. I have one who is cold-natured and likes to sleep wearing hers. They are very comfortable for them. Posted On 12/27/15 by Michael S from ADDISON, IL Yes, Michael S recommends this product! Good hoodie for it's value. A good variety of colors to choose from. Posted On 11/29/15 by Penny S from , IA Yes, Penny S recommends this product! This fits great and is so warm and cozy. I will be getting this in more colors. my dogs love their hoodies. Posted On 11/13/15 by Shawna H from riverside, CA Yes, Shawna H recommends this product! Love these hoodies and my dogs love their hoodies. Posted On 10/23/15 by Jennifer W from , Yes, Jennifer W recommends this product! Posted On 09/27/15 by Chelsey M from Rotan, TX Yes, Chelsey M recommends this product! LOVE these hoodies!! Fit great and wash great, we have the red and just ordered two more colors! Thank you BaxterBoo for affordable, high quality items! I think this may be our fifth hoodie from Zack & Zoey because it is just so darn cute! It keeps my little Pommie warm and snuggly; it fits perfectly at the waist, the neck, all over; love the cute little sleeves and drawstring at the neck; the little hood actually fits over her head - it's not just for show; the color is bright and beautiful. It even "pills" after several washings, just like our human hoodies do, giving it that "worn in" look. You may not like this aspect, but I don't think it detracts from the look of a garment that's, in my opinion, meant for "every day wear". FYI: Make sure you get the hoodie by Zack & Zoey - the other brand they offer was off in the fit, not nearly as cute and I had to return it. Posted On 08/14/15 by MARI W from Dallas, TX Yes, MARI W recommends this product! All these cute hoodies will keep my Pom comfy in cooler weather. Posted On 08/07/15 by margaret from , Yes, margaret recommends this product! Wonderfully made and loved the purple color. I could tell by looking at it that it was too small for my pup! That is the only reason I returned it....really wish they had in a larger size. Purple is my gray haired pup's color so always looking for sweaters, etc. in purple. Nice and roomie - just like a hoodie should be! Posted On 03/10/15 by Lorna S from Roseville , MI Yes, Lorna S recommends this product! My pup was a hit - just add beads and go! Excellent quality for the price. Terrific color choices. It was hard to choose colors. Posted On 03/10/15 by Erin J from Deptford, NJ Yes, Erin J recommends this product! Posted On 03/08/15 by Irene F from , NY Yes, Irene F recommends this product! 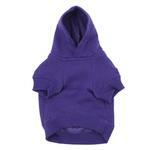 This is the third hoodie I have purchased for my little Yorkie Terrier. The brutal winter temperatures made it important that she could stay warm. She loves to wear them and I love the look of them on her. Posted On 03/01/15 by Erica H from , Yes, Erica H recommends this product! This is a high-quality hoodie. You can tell that a lot of care was put into the making of this product. The fabric is a nice thickness, the stitches are perfect and the medium size fits my 16.5-pound mini poodle mix just right. I was a bit concerned that the underside was close to his privates, but I've taken him potty with no problems. It rides up slightly when walking, but still looks great. Posted On 02/18/15 by Roberta L from , MA Yes, Roberta L recommends this product! Really purple, really pretty! True to size. Posted On 02/13/15 by Theresa V from Cape Coral, FL Yes, Theresa V recommends this product! Love this little Hoodie keeps her warm but not hot!!! Posted On 01/30/15 by LN from , Yes, LN recommends this product! Really cute and well made. I like that there's a hole to put a leash through. It's a tad long for my pup (size M), which is surprising since he has a long torso. The chest area is a little snug, even though I measured him and he should have had ample room. He usually hides when I bring out anything except his collar, but he likes this. Posted On 01/28/15 by Bobbie A from Santa Cruz, CA Yes, Bobbie A recommends this product! This is my second hoodie to purchase for my dog. She LOVES it and doesn't want to ever take it off. And she looks really cute in it. Our dog is a Spaniel/MinPin/Dachschund mix and loves these hoodies! The hood part is not the roomiest but he likes that it keeps him warm during the cooler months. Durable Sweatshirt and vibrant color! Posted On 01/28/15 by jennifer z from , NY Yes, jennifer z recommends this product! I would highly recommend this hoodie! What a great value! It is made well, very durable and soft. I have several hoodies for my dog but this one is a bit thicker, made with fleece material and is much warmer for chilly days. Sizing chart was accurate too! I will have to get another color for her! Posted On 01/23/15 by Rick B from High point, NC Yes, Rick B recommends this product! Great item!! My dogs love these hoodies!! Posted On 01/19/15 by Alexandra P from , TX Yes, Alexandra P recommends this product! My dog absolutely loves this hoodie!! She typically does not like to have clothing on, but she doesn't mind this one, curls up in it, and it keeps her warm when we go outside! Too good a value to only have one. My Pit Mix loves the weight and warmth of this sweatshirt! Posted On 01/09/15 by Karen B from Yakima, WA Yes, Karen B recommends this product! We Love the purple sweatshirt..awesome quality, and it keeps Brady toasty warm..
Posted On 12/22/14 by Carol D from Twp. of Washington, NJ Yes, Carol D recommends this product! Chance loves his hoodie. It stretches nicely to fit him. Purchased in Xlarge, it could be a bit bigger. Other Xlarge clothes have fit him a little better. Posted On 12/19/14 by Amanda V from , AZ Yes, Amanda V recommends this product! Fits perfectly and she seems to love it! Posted On 12/09/14 by Breana from Wenatchee , WA Yes, Breana recommends this product! Peanut loves her basic hoodie! The fleece lining keeps her warm on chilly days or fits nicely under her coat when it's very cold out. She looks adorable in it! Great little sweatshirt for those cold winters! Posted On 11/27/14 by Buffy L from St Louis, MO Yes, Buffy L recommends this product! Great product. My little yorkie has had this on since I received it last week. I haven't washed it yet, and there is a little pill-ing since he's had it. But the fit is great, it has just a little warm fleece in the lining which makes it perfect for keeping him warm this time of year! Posted On 11/25/14 by Tiffany D from McClellandtown, PA Yes, Tiffany D recommends this product! The hoodie feels very soft on the inside. It seems to be comfortable, too, as my dog has no problems cuddling up in this outfit. I have not yet found a use for the pocket, but find it very cute! Posted On 11/24/14 by Roschelle H from , CA Yes, Roschelle H recommends this product! I love the purple color of this sweater! I love the hoodie, it looks so cute on my Winnie, I took a picture with my phone and am going to attempt to send it to the website. Winnie is a shi-tzu/bijon mix and loves to wear outfits, so it's fun to buy for her. Posted On 11/08/14 by Tracy R from kinsley, Yes, Tracy R recommends this product! Very good product the fit is great warm my dogs love all there baxter clothes!! Posted On 11/01/14 by Allison D from Tyler, TX Yes, Allison D recommends this product! Posted On 10/30/14 by Casey S from Cleveland, OH Yes, Casey S recommends this product! I love this hoodie! I also have a blue one for my other dog. They are very durable and easy to wash.
Posted On 10/28/14 by Karla H from , IN Yes, Karla H recommends this product! A-dog-able!! I did have to dry a bit for a better fit..super cute! Posted On 10/26/14 by Kelly S from Omaha, NE Yes, Kelly S recommends this product! Love the style and the color! Fabric is soft, and my dog seems comfortable wearing his new Hoodie! Love it! Posted On 10/12/14 by pam w from hampton, VA Yes, pam w recommends this product! What can I say? Hoodie got here on time in the correct size. Fabric seems good quality and best of all it fits my pit. Easy to find cute clothes for toy breeds gets harder to find the larger the dog. Baxter Boo carries a great selection in a wide range of sizes. This is so cute, I have a chubby shih-poo that I have trouble finding coats for as although she is rubenesque, she is short in length. This fits perfectly over the chest & belly area and is not to long. I love this product. Very well constructed, have them for all of my girls! In multiple colors! It gets the Kati and Lissa Lu seal of approval! Posted On 01/08/14 by Hannah N from Lake Elsinore, CA Yes, Hannah N recommends this product! This is one awesome sweater. My dogs love it. Posted On 12/07/13 by Elizabeth K from , CO Yes, Elizabeth K recommends this product! My senior Weimaraner needs a little extra warmth and comfort. She loves her hoodie. When she gets cold she will pick it up and start demanding I put it on her. Easy to put on. Easy to care for. Great color, great fit, keeps them cozy! I have three dogs and I've been "collecting" these Basic Dog Hoodies since I got my first one. The purple is such a great color for my little ladies! It's gorgeous and great quality. Make sure you don't order a size too big because I made that mistake and my dogs were falling out of them... I had to reorder everything in the size down. Don't want your furbabies to get hurt! Posted On 11/08/13 by Allison B from Chicago, IL Yes, Allison B recommends this product! Great product, good quality, super soft. Only issue is the sizing for my French bulldogs. Had to order up a size to fit their chest which makes the sweatshirt too long. Posted On 11/08/13 by Cherie S from , CO Yes, Cherie S recommends this product! I love this Hoodie & the way it looks on my dog is too cute. Posted On 11/07/13 by Todd from Brigantine, NJ Yes, Todd recommends this product! Love this hoodie. Great color choices. Medium fits great on my 15-16 pound Maltipoo. Posted On 11/07/13 by birgitte gjernes from nanaimo B.C, Yes, birgitte gjernes recommends this product! We like the color assortment and have most of them. Obs. color runs when washing. I'm glad you kept me on file and notified me when out of stock items came back in stock.